Analysts like to bemoan the PC industry's penchant for "racing to the bottom," but they always seem to forget the benefits of low-end competition: Bargain prices for better hardware. Asus new ZenBook UX305F is proof that racing to the bottom doesn't always have to end in a duffel bag of compromises and tears. In fact, the ZenBook UX305F is one those laptops that defies conventional wisdom on build quality, specs and price. I'll hit you with the big news up front: The ZenBook's decidedly budget price of $699 (and now a bit cheaper at Amazon). For an ultrabook, that's a big deal. That's because most "ultrabooks" at this price really aren't that ultra. They're clunky and chunky bricks that pack 10rpm hard drives that load Windows so slowly you can practically watch the pixels fill in one by one. Despite its budget price, there's very little low rent about the ZenBook UX305 that I could find. One look at the ZenBook tells you it's not a plus-sized laptop masquerading as an ultrabook either. Outside, there's no cheap plastic, it's an aluminum skin. Asus says the shell is constructed of .5mm thick aluminum, which makes it one of the thinner 13.3-laptops around. The Dell XPS 13 2015, for example, measures at 18mm. The original ultrabook, Apple's MacBook Air 11 is 16.8mm. The Asus? 13mm. Inside you won't find a Celeron, Pentium or similar low-rent Bay Trail-based Atom SoC, Asus instead taps Intel's low-wattage Core M 5Y10 CPU. 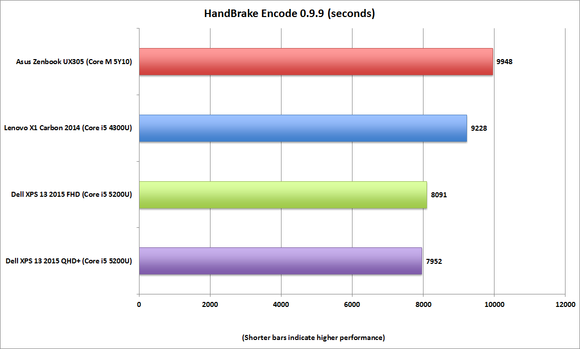 That's a Broadwell chip, but the Core M is locked down to consume a third of the power of a Core i5 or Core i7 Broadwell. 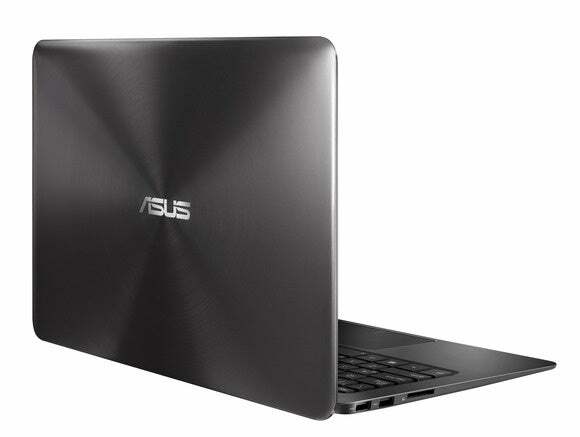 That lets Asus actually build the ZenBook as a true fanless laptop, so it's utterly silent. The company says the ZenBook features "IceCool" design, using chromium copper alloys to keep the CPU and internals of the laptop from cooking. That may be true for the insides, but I did find the outsides could get hot. After running an encoding test for an hour, I snapped thermal images of the back and front of the ZenBook and saw temps of 120 degrees and 118 degrees. A similar HP EliteBook that I'm reviewing, with its (admittedly slower) Core M chip, was almost 20 degrees cooler. The fanless ZenBook UX305F after a one hour encode gets almost too warm. The ZenBook is the second Core M-equipped laptop I've seen. Ultraportable performance isn't as critical as it is for, say, a gaming desktop or workstation, but it's still worth measuring. 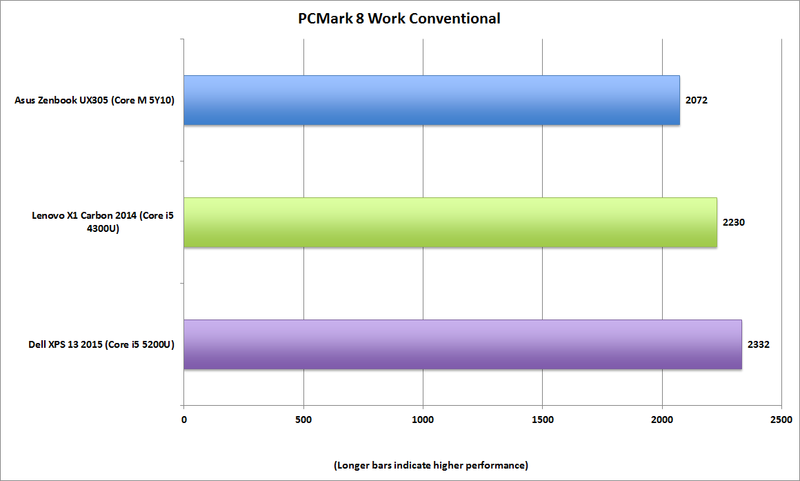 To do that I first looked at how well that Core M does against Dell's XPS 13 2015 and a Lenovo ThinkPad X1 Carbon in PC Mark 8's test for work tasks. It's nothing to write home about and that's what I'd expect. The test is designed to measure office drone tasks, and we can all agree that it plateaus pretty quickly once you get to a certain performance level. The upshot is that you really don't need an overclocked 8-core Core i7 to run Microsoft Word or human-level Excel tasks. PC Mark 8's Work Convetional load measures how fast a laptop can handle boring old office drone tasks. I also ran our standard encoding tasks, where we take a 30GB MKV file and transcode it using HandBrake to a size and format friendly to an Android tablet. It's a heavy workload for a laptop, but not unheard of considering the capability of laptops. While you don't need a big CPU in office tasks, you can see where the dual-core Core i5 chips, with their greater power consumption and higher clock speeds, have an advantage. With a third of the thermals to work with, the dual-core Core M 5Y10 just doesn't have the megahertz to keep up with the pack, but it's still respectable. I wouldn't let this be a deal-breaker unless CPU-intensive chores are Job no. 1. If so, it's worth paying for a Core i7 part instead, but in general, most people won't notice much of a difference with a Core M.
The fanless Core M definitely gives up pure CPU performance but not as much as you'd think. The Core M CPU is about low power and low thermals. What you get is better than Atom/Celeron/Pentium performance, but still far less than a full-tilt Core i5 chip using a CPU that consumes three times its power. 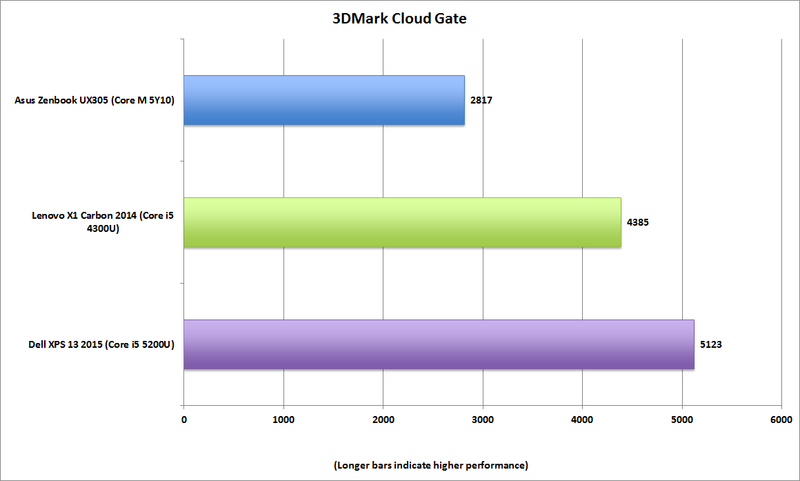 That becomes very apparent in our HandBrake encoding test, and also running the graphics test 3DMark Cloud Gate. As you can see, you give up a lot of performance. Granted, the integrated graphics in an i5 won't let you play a graphically intense game at any reasonable frame rate, but the Core M's gaming chops take a definite backseat—they're about the equivalent of HD4000 graphics in an older Ivy Bridge CPU. You do give up considerable graphics performance by going with the low wattage Core M Broadwell chip over the Core i5 Broadwell U part. Perhaps one of the most important metrics in a laptop is battery life. I ran MobileMark 2014 on the ZenBook and then compared its numbers to the Lenovo ThinkPad X1 Carbon and both Dell XPS 13 units. MobileMark 2014 is a real-world rundown test, using off-the-shelf popular apps such as Office and Photoshop and replicating a typical work session. The test simulates a person pulling up an email and sitting there and actually reading the email for five minutes, for instance, rather than simulating a person typing like an automaton for eight hours straight. With its 45-watt-hour battery and power-sipping Core M chip, the Zenbook lasted a healthy 638 minutes. The Dell XPS 13 2015, with its even larger 52-watt-hour cell (but higher-res screen) comes in a bit worse, at 602 minutes. I also had time to test the most natural competitor here: Dell's XPS 13 2015 with 4GB of RAM, a 128GB SSD and 1920x1080 screen. With a sticker price of $799, it's the most direct competitor to the ZenBook. You can see what happens to the Dell XPS 13 once you shed the high-resolution panel and touch option: A healthy bump from 602 minutes to 728 minutes. 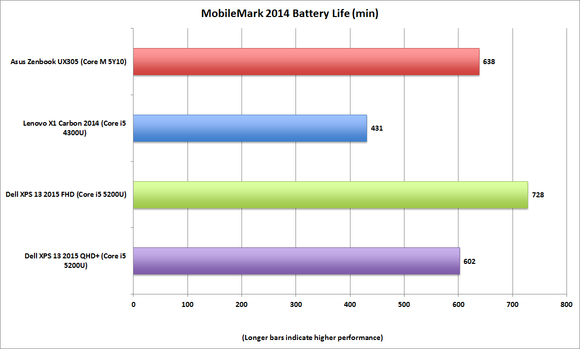 The older ThinkPad X1 Carbon 2014, with its 46-watt-hour battery, does the worst at 431 minutes. I'm expecting to see the updated ThinkPad X1 Carbon soon, so we'll see whether the X1 Carbon can stage a comeback. The ZenBook UX305F and its Core M has admirable battery life of 10 hours. Only the 1080p version of the Dell XPS 13 2015 out runs it at 12 hours. Moving back to the physical attributes of the ZenBook, I have to say I expected far more corners to be cut. For example, I expected the 13.3-inch screen to be an inferior TN panel. Instead, Asus uses a 1920x1080 resolution IPS screen and an anti-reflective coating. Asus makes a version with a 3200x1800 panel and also offers optional touch. The 1920x1080 display is competent. I didn't see any terrible color banding, and although Asus rates it at 300 nits in brightness, it pegged our meter at 340. I did see noticeable light leakage from the backlighting when cranked up to maximum in a dark room. But at normal brightness levels for a darkened room, it's not atrocious. In storage, I also expected a budget move too, like a hybrid drive or a leftover mSATA drive. Nope. Asus actually surprises with a 256GB M.2 SATA SSD. Let me say that again: A 256GB SSD. If you think about it, that's far more than what you're getting anywhere else. Period. Few corners seem to have been cut from the UX305 despite its price. I even found the keyboard to be pretty good. One of my complaints with Dell's XPS 13 2015 model is a slightly compressed keyboard and small keys. Its keys measure 14.7mm wide and tall. The ZenBook's are 16.2mm wide and 14.7mm tall. That may sound like nothing, but my typing was more accurate on the ZenBook's even though the keys felt a little spongy to my digits. If I were nitpicking, I'd note the lack of backlighting—and then Asus would just throw the $699 price in my face and tell me where to go. The trackpad on the unit appears to be an Asus design. My reference is the Google Chromebook Pixel's excellent etched-glass trackpad. This is not in the Pixel's class and has a definite metallic feel, but it's quite usable, and palm rejection on the default settings was quite good. If you were looking for something to complain about, it would be the wireless. Asus put in a dual-band 802.11n radio instead of 802.11ac. For most people it won't matter and is probably worth the trade-off for the extra RAM and storage. What this comes down to is a major breakthrough in price for an ultrabook. I thought Dell's XPS 13 2015, with its $799 price was a big breakthrough (and it is), but you give up in RAM and storage to get to $800. The same goes with Apple's MacBook Air 11, which has a tiny, low-res screen and, like the Dell, a limited 128GB of storage and 4GB of RAM. At $699, the ZenBook sets a new standard in what to expect in a budget ultrabook. I dare say it feels like an injustice even to call this a budget ultrabook. In fact, maybe it's not that the ZenBook is low-priced, maybe it's that the others are overcharging you. Correction: Our initial review incorrectly stated the resolution of the panel. It is 1920 x 1080. PCWorld regrets the error. 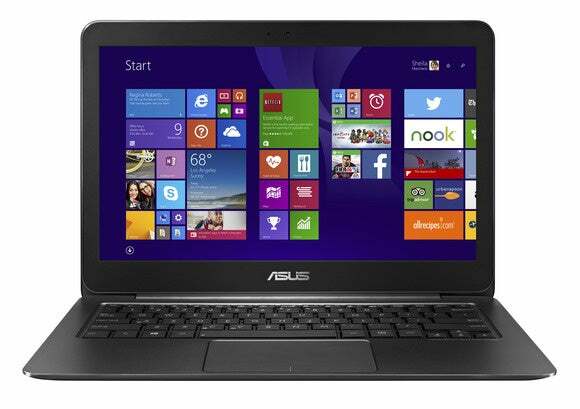 The Asus Zenbook UX305F is simply the best deal for an ultrabook that we've ever seen.